There are plenty of packages for R that allow for fetching and manipulation of companies’ financial data, often fetching that direct from public filings with the SEC. All of these packages have the goal of getting to the XBRL data, containing financial statements, typically in annual (10-K) or quarterly (10-Q) filings. 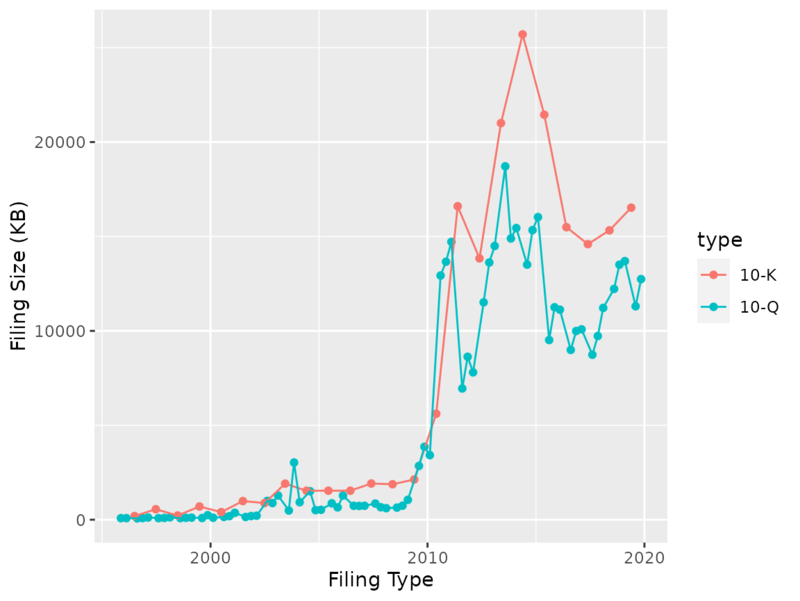 SEC filings however contain far more information. edgarWebR is the first step in accessing that data by providing an interface to the SEC EDGAR search tools and the metadata they provide. Search for companies and mutual funds. List filings for a company or mutual fund. Using information about filings, we can use edgarWebR to see how long after the close of a financial period it takes for a company to make a filing. We can also see how that time has changed. Note that explicitly filtering caused us to go from 99 to 95 rows. We’ve received filings dating back to 1995 which seems good enough for our purposes, so next we’ll get the filing information for each filing. So far we’ve done everything in base R, but now we’ll use some useful functions from dplyr and purrr to make things a bit easier. # this can take a while - we're fetching ~100 html files! 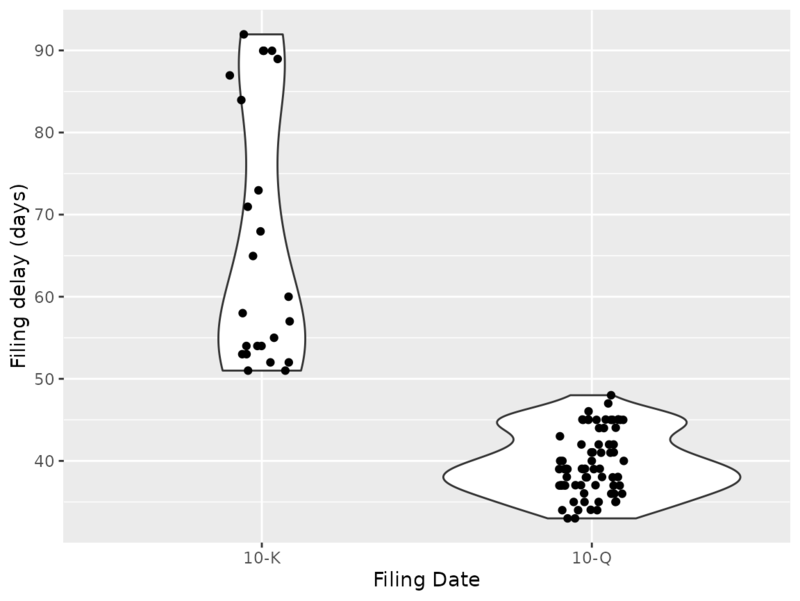 Now our data is arranged, we can run some summary statistics and plot using ggplot2. #> Don't know how to automatically pick scale for object of type difftime. Defaulting to continuous. Whether because of some internal change or change to SEC rules, the time between the end of the fiscal year and the 10-K has dropped quite a bit, though there is still a bit of variation. An interesting extension would be to compare the filing delays to the company’s stock price, overall market performance and other companies to see if there are particular drivers to the pattern. 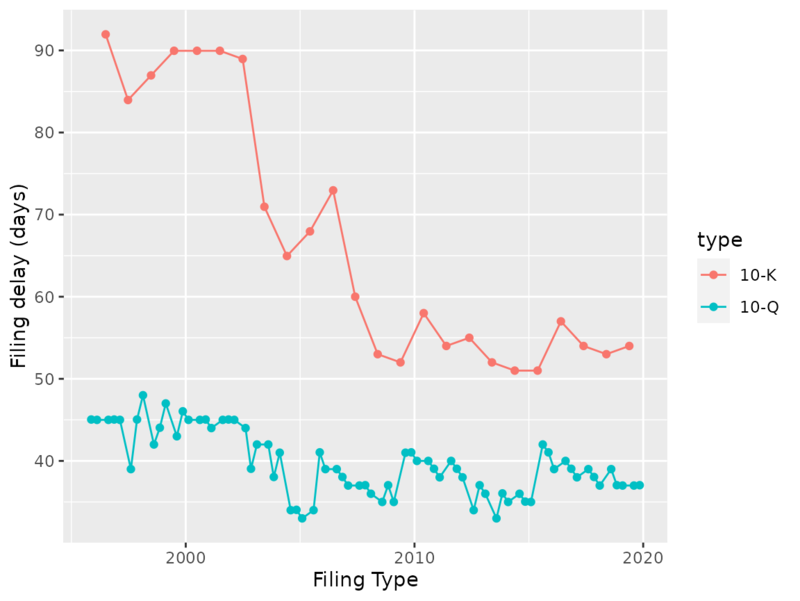 The jump in size ~2010 is the requirement for inclusion of financial datafiles starting, but there is still interesting variations. The SEC contains a wealth of information and we’re only scratching the surface. edgarWebR itself has a lot more functionality than what we’ve explored here and there is more coming.